At last, we get to the end of the film pipeline. Postproduction is everything that comes after shooting has finished (except for pick-up shots, which are just more production, and won't be covered except to say that if you're doing any something went wrong and hopefully you left room in your budget for reshooting. If not, a great postproduction crew (especially a great Editor) may be able to save your film anyway. Maybe even make it just as good, if not better, than it would have been had you spent money reshooting and skimped on post. Before any postproduction happens, your footage must be taken into the system. If you're shooting film and cutting the negative you shot, then you're all set -- and you're probably also time-shifted back about 20 years or so. Even if you are cutting film, you'll want to make a dupe neg, cut that, and then conform the original negative. More likely, however, you're going to scan your film digitally, or deliver your digital footage into the digital system (and then ultimately either do a negative conform to the digital edit decision list to create the dupe neg -- or just make your dupe negatives using a film printer). Both film and digital delivery into post may require conversion (not all digital formats are the same). Either you've set aside money in your budget for this or, and only a no-budget shooter would even contemplate this, you're going to spend a ton of time mastering the conversion system and acquiring footage yourself. No, simply opening up Final Cut doing the default acquire for your device isn't going to give you the best possible results. Visual Effects are optical or (nowadays, generally) digital techniques used to create imagery that isn't in the photographed footage. (Special Effects are practical techniques for creating effects in the photographed image, generally 0n-set and with the actors in the shot with the effect -- though not always.) The images generated can range from fantastical fantasy and sci-fi creatures, buildings, and vehicles, to dangerous things like explosions, fires, tornadoes, and tidal waves, to "mundane" things like normal buildings and scenery (and these backgrounds may be traditional matte paintings, or sophisticated digital 3D set extensions). Effects artists work from the storyboards and photographed footage to create these new elements, compositors layer the effets work into the original plates, and effects editors cut the results back into the film based on the Editor's overall pacing and tone decisions balanced against the special requirements of the effect. VFX is an extremely technically complex aspect of filmmaking, and it since most Indie Auteurs won't be dealing with VFX much, if at all, it's a topic best left to a future post -- but only after the release of the <a href="http://www.visualeffectssociety.org" target="_blank">Visual Effects Society</a> Handbook for which I am writing chapters about pipeline. Editing is the third and final major revision of your film. First the script (and boards, if you made any) were revised and revised. Then the film was shot, with all sorts of on-set decisions being made that changed the shape of the film. The editing room is where the last big changes are made before the film is released. The basics of editing are simple: look at the shooting script, breakdown, shot logs, and footage, and create from the footage what is in the breakdown. However, a skilled Editor has as his or her job helping the Director make the best possible film, including going off script and picking different takes than the circle take, changing shot order and length, and pretty much anything else than can feasibly be done given the footage in the can. Collaboration with a great editor always results in a much better film. Since editing is assembly of the final film, this is where the pacing and tone is established. Pacing is all about timing. When do we see what, and for how long? What comes before and after? Tone is in part dictated by pacing and what is left in and what is taken out of the material. It is also in part dictated by the acting -- but it is also the result of choices made about sound design, music, and color palette. During the Edit phase of postproduction, generally the longest phase (unless it is a VFX heavy film, in which case the craft-intensive VFX work may take longer than everything else involved in making the film combined), pacing and tone are the order of the day, and that is what everyone is working on: trying to use picture and sound to get the proper emotional impact out of every moment in the film. Editor: While the editor generally does the actual work of cutting the picture his or her self, they are also the person responsible for the overall editing of the film. Other than the Director, the Editor has the most influence over the pacing and tone of the film because all other editorial decisions are made based on what is happening in the picture edit. Assistant Editors: Handle acquisition, logging, data management (of footage and sound, but also script, breakdown, and shot log info in a database) for the editor. May also do rough assemblies of sequences for the editor (sticking closely to the breakdown, log and shooting script specifications). Sound Editor: The person responsible for editing sound on the film, which may mean all the sound, or it may mean all the sound except for the music, or it may mean just the sound effects and foley (the term comes from the latter, but in the cases of very talented major sound editors and/or low budget features with small crews, the sound editor may do all the sound). Without the effects and foley, a film sounds quite flat and lifeless -- this is a very important job that is often underappreciated. Dialog Editor: In the traditional case where Sound Editor is responsible for effects and foley editing, the Dialog Editor is responsible for the potentially very complex task of dialog editing. This means cutting in and syncing-up the best possible dialog choices that correspond to the picture editing choices. This may mean trimming, cleanup, and sync of dialog from the same take, or clever manipulation and syncing of dialog from one or more other takes. When the dialog is spotty for either technical or performance reasons, the Editor may be doing a lot of tricky cuts that in turn mean tricky cutting and syncing for the Dialog Editor. Sound Designer: Sometimes a Sound Editor does all their own effects selection and/or performance, and sometimes they work with a full-time Sound Designer whose job is to create new sound effects. Foley Artist: A Foley Artist is basically a performance sound designer whose job is to create, in real-time as they watch running footage, sound effects that match the image. Foley Artists are the ones who clap blocks together for running horses and punch slabs of meat and break bambook for fistfights. Digital sound design and editing is making Foley less common, which is a shame as it's a lot of fun. A.D.R. Editor: Additional/alternate Dialog Recording, or Dubbing, is the process of replacing the voices in a film with alternate performances. Dubbing foreign language films is one use, but the one we care about here is using A.D.R. to salvage footage that has good picture but bad sound (either for technical or performance reasons), or to add or change dialog because something isn't working in the text. The A.D.R. Editor works with the Director to guide the Actor through this process, in which they watch the shots being altered, and attempt to deliver the new performance in a manner that fits the footage as closely as is possible. Composer and Orchestrator: The Composer and Orchestrator create the score to match the film. Sometimes this is done well before postproduction begins, though that is suboptimal. It is much more successful for a Composer and Orchestrator to score based on early edits of the film, refine until the film is near final picture, and then let the orchestra, band or synthesist perform the score while watching something close to the final edit. Music Editor: A Music Editor may edit the score into the film in the case where the Sound Editor is only a sound effects and Foley editor. In the common case where things change after the Composer and Orchestrator have already wrapped off the film, the Music Editor is responsible for recutting the existing musical performances in a way that best fits the changed picture and sound edit. In order to nail down the pacing and tone, Editing is often done in close collaboration with sound editing, dialog editing, sound design, and scoring. The timing of shots influences the length of pieces in the score, and where the highs and lows are placed in the music, and vice-versa. The same goes for sound design and editing. Each new cut of the picture influences the Sound Mix. All that editing results in an assemblage in which the timing may be perfect, but the sound and picture levels most likely are not. Sound mixing is the process of getting all those levels right for the sound, and balancing the dialog, effects/Foley, and music in a manner that allows the audience to always hear the text, and brings forward the music and backgrounds for effect at appropriate moments. The dialog and effects/Foley are generally mixed separately from the music, which is mixed by a professional music producer/mixer in the manner music is mixed for an album release (i.e. the levels are mixed relative to the rest of the music to create tonal and emotional dynamics). Only then is a final sound mix done where the three elements are brought together and the overall levels are balanced out so that the text is comprehensible while also giving you the layers of background and music that make it feel like a film to an audience. How the three elements of sound are first edited, and then mixed, heavily influences the tone of the film. If you've got the same war footage, adding bombastic music and keeping the sound effects frequent, loud and clear (Michael Bay, etc.) is a much different tone than adding brooding music and/or occasionally bringing in a cacophony of sounds atop a baseline of muted backgrounds or outright siglence (Saving Private Ryan Beachhead Scene, etc.). On very low budget films, the Sound Editor may very well also be the Sound Mixer (and maybe even the Music Mixer), and all the cleanup and mixing may happen on an ongoing basis alongside the editing. Color Grading / Timing and "D.I." Color Grading is the process of digitally adjusting the imagery to get the final visual tone, similar to how sound mixing creates the final aural tone. If a lot of manipulation is done to the image, sometimes the term "Telecine" or "Digital Intermediate" is used instead of Color Grading (even though no matter how little you do to the image, any process that takes film, digitizes it, digitally alters the image, and then films out for release is a digital intermediate process). Color Timing is a holdover term from optical filmmaking wherein the final color was balanced by timing how long each color of light was shining on each frame during exposure of the dupe negative. All this terminology just means: we took the original image, possibly converted it to a different format, and then did something to it to modify the appearance of the image in frame. What is done can be subtle or extreme. Traditional grading consists simply of adjusting the color and value of the image (optically or digitally) so that adjoining shots that are supposed to appear to the audience as being in the same time and place look as much like they were shot under the same lighting conditions as possible. But a lot of the tone of a film comes from this process. When Directors and DPs have ideas about the thematic, emotional, or philosophical aspects of a film being coded by a look -- warm vs cool, high contrast vs low, and so on -- they traditionally did as much of that as they can with on-set lighting. But rarely is that perfect, and shots must be corrected relative to each other. This correction technology evolved to today's digital technology, which is causing more people to shoot a neutral palette put off the final decisions about tone until post. (Why taking that attitude too far can easily lead to acting performances that don't match your tone may seem obvious, but if it were so obvious it wouldn't happen so often and thus it still will wind up the topic for a future post). Extreme lighting effects (deep blue lighting, extremely high contrast, etc.) which when done on-set could pose a high risk to the footage being usable at all are now more often being shot with a more subtle on-set treatment and "punched up" in post -- or whole new looks are created in post, using digital tools (if you've never seen a big grading system like a Lustre, think Magic Bullet Colorista or Apple Color (or the built in FCP color grading) or the keying, rotoing and color manipulation parts of After Effects or Shake on steriods, and if you've never seen any of those things -- think Photoshop optimized for moving images, and then some). There is a saying in the business that projects are never finished, they're abandoned. Eventually you run out of budget, or energy, or inspiration -- or a Studio Executive arrives to inform you that either your film arrives at the duplication house tomorrow, or you'll never work in this town again. Then you're done. If all has gone well, you've done every thing in all four pipeline posts at least twice (meaning you've iterated on every step a couple times, done at least a couple takes of every shot, and generally given yourself and your crew the opportunity to make changes for the better at every step along the way). You could iterate on every step more or less forever, because you can always find something you <em>think </em>could be better (though eventually you'd just be making it different, but not necessarily better). Fortunately, you're eventually forced to either move on or abandon the project, and as a result films are occasionally completed and released. Now rush out and see your film with an audience so you can take your friends out for beers and make them listen to you brooding and raging about that guy who got up and left in the middle of the best f***ing part of the whole film! (Because 99% of all artists are too self conscious to ever bring themselves to focus on all the people enjoying themselves and appreciating their work). In Part 2 of the film pipeline overview, I discussed the final aspects of production before going on-set. Once you're on set, however, the character of production changes. It becomes much more intense, as there's always a ticking clock. It really is like a second act in that there's an ongoing race against the clock, herculean efforts to overcome obstacles, and rising and falling tension as on-set problems flare-up and are resolved. It may seem like everything is happening all at once, and that on-set production is total chaos rather than a pipeline. This is only true if you let it get out of hand. But when you're inexperienced, your production simply will get out of hand at times and you'll just need to get it back on track. To help you do so, it helps to understand what things basically ought to look like if they're going right, so here's an overview of on-set production as a process. What is especially helpful about this is that while the actual on-set activity may sometimes seem overwhelming and frenzied, when looked at as a process the structure of on-set production is relatively simple. Knowing this pipeline can help you focus and bring things back under control when something goes wrong. The day starts with a crew call. On many sets, the Director and Producer may not even be on set at this point -- particularly if there is a location move involved. The First A.D., Line Producers, Location Manager, Key Grip, and Gaffer are responsible for getting the location moved and equipment ready. Other services, such as portable toilets if needed and craft services, are also expected to arrive early. The camera crew (often without the D.P.) arrive to start prepping and testing the camera. When the D.P. is scheduled to arrive, the camera crew, grips, and gaffers are expected to be ready to start putting lights and cameras onto the proper grip gear and into position for the first shot of the day. If sets need to be constructed, the Set Foreman heads this up, and the arrival of the Art Director is the cue for set dressing to begin. All the mechanical aspects of prepping the set are expected to more or less be done before the cast arrives. The Director (and Producer) may choose to oversee any and all of this, of course. It depends on the level of trust you have with your crew. Very experienced Directors with experienced crews, particularly ones they've worked with before, trust everyone to work from the boards, previs, set blueprints, art packets, and so on that the Director has already approved in preproduction -- and the Director makes occasional walkthroughs during initial setup to make sure all is well, or decide on last minute changes when inspiration strikes. Otherwise, the Director focuses on working with the actors (and, if necessary, the writer -- see below). On-set script and storyboard revisions happen for one of two reasons: the Director has a flash of inspiration, or disaster has struck. In the former case, it is dependent upon the Director's personality (and the extent of the change) whether to bother with script and board changes or to just give verbal adjustments to the cast and crew. In the case of disaster -- whether it's a scene or sequence that just isn't working, a cast member has quit (or, God forbid, become too sick to work or passed away), or the production has fallen so far behind schedule that major portions of the script need to start getting cut -- it is best for all involved to get the changes down. It will help mitigate the chaos of the disaster, and the comfort of seeing the changes committed to paper will enable you to more easily get back on track. By the time the cast is scheduled to arrive, the set is expected to be ready for them. The First A.D. and Production Assistants will check the arrival of the cast, make sure they get call sheets, answer questions, bring them water and snacks, and generally get them settled-in before the Director arrives to go over the day's shooting. Not all sets bother to (or can afford to) give the cast and Director time before the shooting starts, but if you can make it happen, it's a great idea. It allows the cast to ask questions and give suggestions to the Director in a more intimate environment. Some actors don't feel comfortable either seeming to need help, or giving suggestions to (or being critical of) the Director, in front everyone. Time spent alone can enable a freer exchange of ideas, and help diffuse potential issues before they become a big deal. Once a cast member is on-set and informed of the day's work, they will get their hair and make-up done, and wardrobe fitted. This may happen before or after the Director check-in, and if the preparations are especially complicated (which may be the case for special effects make-up or elaborate period costumes), the cast call may be at exactly the same time as the crew call (unless, of course, a location move has happened and the wardrobe, hair and make-up trailers or rooms are being prepped), and the actors may be in wardrobe, hair and make-up the whole time the technical set-up is happening. Lights (1), Camera (2), and Grip gear (3) are set-up. For the first shot, things are supposed to be pretty close when the cast arrives, but the D.P. still needs to visually inspect the shot with the actual cast in-place, take light readings, and make any necessary adjustments to the lighting and camera rigs before shooting. When a new shot is started, things may change radically. This is when the cast and many other members of the crew get a break (or, in the case of the cast or a crew lead who needs Directorial input, perhaps go talk with the Director) as the camera crew, gaffers and grips work fast and furious to get the next shot ready. Sound gear is set-up (4). This basically consists of the boom operator getting into proper position, and the sound recordist doing level checks. To make this work as it should, the boom operator has been in rehearsals with the cast, is present for all on-set warm-ups, and gets informed of any updates to dialog and timing. If that's happening, an experienced boom operator can get set-up without having to ask for run-throughs before the actual shooting. All the parts of this set-up that requires interaction with the cast are expected to happen very quickly, so the cast spends minimal time worrying about technical issues and maximal time acting. Shot Direction is given (5). Once the set-up is finished, the Director gives the final directions to the cast and crew. If it's not the first take, then refinement directions are given -- or the call is made that a good take has been achieved and it's time to move on to the next shot. Once all the set-up is done, and Direction given, the First A.D. calls "action". Then the cameras roll, almost always for a very short period of time, and then the Director calls "cut". That's it. You just shot a take. This process happens again and again until the shooting day is done. In between takes, it's just the Director giving direction and occasional technical tweaks (and/or touch-up on wardrobe, hair and make-up). In between shots, it's just somewhat longer versions of the same thing. Sure, throughout the day there are meal and restroom breaks, longer set-ups during which some people get to take a break, and so on -- but a shooting day is basically this over and over again: technical set-up / adjustment, cast and crew direction given, and roll cameras. Once you've done that for as many days as scheduled for shooting the entire film -- have a wrap party, because now you're ready to go into post production. NOTE: Animation has a much different production pipeline, which I have written about in the Visual Effects Society Handbook of Visual Effects. Future articles will cover some of that material, but this series is about live action production. As mentioned in part 1 of this series, production really begins with a production greenlight (which may come at the same time as preproduction greenlight, or only afterwards, depending on the project.). For bigger films, this is dependent upon getting a go-ahead from the financial backers (a greenlight from a studio executive for a studio film, or delivery of materials that convince indie backers to go ahead and release funds promised). For no-budget films this is when you decide: "hey, I like what we've gotten out of prepro, let's go shoot this thing now." Prior to going on-set, production includes the tail end of pretty much everything going on in preproduction. Indeed, the distinction between late preproduction and early production is debated. If you mark a production greenlight as the start of production (as some studios do, and I am using in this series), then these tasks happen during early production. But if you mark the first shooting day as the start of production (as others do), then what I'm calling early production is instead late preproduction. Either way, the tasks you must perform are the same. Sign those final contracts with all your remaining actors as quickly as you can, because your schedule depends on it (and depending how large a percentage your casting cost estimate is relative to the rest of your budget, you may not be able to budget for crew and materials until you do this). The final casting is also needed so you can start rehearsing (and doing those last script tweaks before hitting the set), fitting costumes (and working with the production designer to refine any costumes that aren't working now that the real talent is selected), doing make-up tests, using real talent in camera tests to start finalizing lighting and film stock choices (some talent, particularly big names, won't allow this -- and/or you can't afford it), getting to know people so you can develop a working rapport with them, and (and this is serious with regards to primary cast and crew) finding out about dietary restrictions before starting the process of hiring a caterer. Rehearse as much as you can afford, financially (unless you or your lead are the kind of folks who absolutely hate rehearsing -- in which case, I hope you're both excellent under pressure). You're about to go shoot a movie. On-set work is the post people intensive part of the filmmaking process, and now you've got to go out and hire the entire rest of the crew (actually, the production staff and department leads you hired in preproduction do). For a large budget film, you may be about to hire and schedule several hundred people. Everyone from the most senior craftsmen and technicians to the lowliest P.A. need to be signed-on now so that legal and payroll can get them on the books, and production (First A.D. and Line Producers) can get them onto the schedule, and production accounting can start itemizing this part of the budget. In reality, big productions do the entire budget and pre-assign salaries and schedules, and then people either agree to take the jobs or not. No-budget shooters on the other hand need to be more flexible with timing and compensation because you've got as much of the latter as you can squeeze out of people and very little of the former, and crew casting will drive the budget and schedule rather directly. You need to finalize your locations both for the budget and schedule (getting the final budget and schedule right is the driver for much of late prepro / early production), and so that your art department can start translating the Production Designer's vision into reality by building and buying sets and props based on the images and measurements gathered during location scouting. You may not be able to build full sets for some locations (be it extensions and dressing for what is properly called a location, or a what is properly called a set to be used on a soundstage) at this point, because they're too large and/or site specific to be built in a workshop, but everything else is fair game. You want all the props and as many of the set pieces as possible to be done before you go on-set / on-location. Finally, you need to just stop getting ready at some point. There is a saying in the business: no project is ever finished, it merely gets released. (And many variations thereupon.) Script revisions, storyboards, production design, previz and camera test tweaks need to end some time, and probably some time before you spend more on them than you should have is a good time to do that (especially if you're observing diminishing returns in terms of making the storytelling -- visual and textual -- better). You really need to stop changing these things as soon as possible so that all the rest of this stuff can get locked down -- especially the schedule and budget. Movies usually go over budget and off schedule because of ongoing changes. Indecision, second guessing, infighting amongst power players, and so on can be the cause of these changes, but if they're not curtailed it can mean financial (and artistic) disaster. Some studios, like Pixar, have spent years (and huge amounts of money) figuring out how to carefully balance the need for ongoing and sometimes very late changes to make the film better with knowing what not to change, and fitting those changes into a carefully crafted whole. Pixar has a well developed system for doing this, and a large, talented staff who have learned over many years how to pull it off. This approach provides great results for a few studios, and is an unmitigated disaster for others. And even for the experts, it is neither easy nor cheap. The kinds of changes that require a lot of care (and cash) to pull-off aren't on-set moments of inspiration that take a single scene or a sequence in a slightly new direction, they're the ones that lead to big structural changes. You need to go on-set prepared to deal with little flashes of inspiration, big changes, and a million disasters of varying sizes alike by having a well-laid foundation you're building on. If you go on-set with everything still in flux (or so recently having been finalized that you haven't had time to internalize your own vision and decisions), you'll get confused knowing what piece goes where, and things can easily spiral out of control. If you find yourself continually making major changes throughout late prepro / early production, maybe your film isn't really ready for production. And if your film isn't actually ready for production, why is it in production in the first place? If more executives (and producers, directors, etc.) asked themselves this question seriously (paying it lip service is easy), there would be more quality films coming in on-time and on-budget. Over the last twelve years at Pixar I've done a lot of pipeline design and development for animated films (I've co-designed the production pipeline for two features, and contributed pieces to several others). 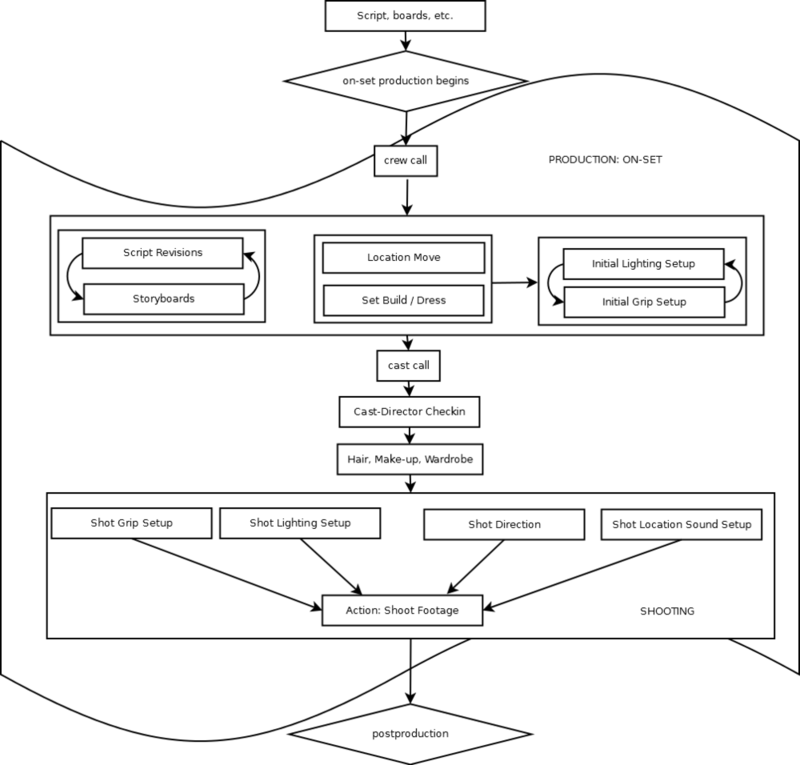 So I figured I'd apply the diagramming and analysis techniques I use to create a general film production pipeline overview that basically applies to all films at all budget levels. Simply stated, preproduction is everything that happens before you start shooting, production is all the stuff that happens while you're on-set and shooting, and postproduction is everything that happens afterwards. For animated films, "shooting" is everything that happens starting with layout and ending with rendering. The diagrams and summaries I'll present are influenced by my big budget feature work, but the way to apply them to smaller budget films is to simply scale them down. In doing so, some pieces may fall off if you don't have a friend who can do them for low enough cost (storyboarding and previsualization being the main pieces of preproduction that are most easily cut). Preproduction starts when a project is greenlit. Depending on the approach at the particular studio or production company, the very first person cast may be a Writer, a Director, or a Producer. In order to proceed from development into preproduction and have it be maximally successful, all three of those positions need to be cast before moving on. And in order to proceed with certain tasks in preproduction, you then need to cast your Cinematographer, Production Designer, Production Accountant, Location Scout, Casting Director, and First A.D. You will need these people to do the first script breakdown (Producer, Director, and First A.D.), and then begin technical / craft preproduction as well as scheduling, budgeting and financing. Casting your on-screen leads will have a very direct impact on both script and story development and budgeting and financing. If you cast someone with enough stature relative to your film's budget, you will be required to give them some say in the development of the story in return for the fact that their signing-on will be a major step towards securing financing (and may increase your budget, too, depending on how big a name they are relative to your project's size, balanced against how friendly they are towards you and your vision). And, the earlier you cast, the earlier this input can be gathered, which means better preproduction results, as well as an earlier opportunity to start rehearsals. A script breakdown involves taking the pre-shooting style script and breaking it into shots in the style of a shooting script. People generally think of the first shooting scrip breakdown as happening right before going on-set, but it really needs to happen before you can start budgeting and scheduling, which you'll need a first pass on before you can start to go out for financing. The first script breakdown also helps the Cinematographer design appropriate camera tests, and the Production Designer, Location Scout and Casting Director to start finding the look, key places and key on-screen talent for your film. A different kind of breakdown is needed to deliver the script into the Storyboard department (if you'll have one), but the first pass at a shooting breakdown is essential for Previsualization (if you'll be doing previs). Everyone in preproduction will be working off the script breakdown, so it's crucial to do a complete pass on this before moving forward. Money, time and contracts all must be managed in order to actually produce a film. Budgets and schedules are simple to conceptualize, and difficult to get right. A schedule is just a detailed list of things you want to do, with how long each will take and who (cast and crew) and what (locations, equipment, sets and props) needs to be there.Â The budget is derived from the schedule by figuring out how much each of those things costs per day, and adding it all up (remembering to include preproduction and postproduction as fully scheduled and budgeted aspects of making the iflm, as well as overhead, with potentially substantial fixed costs like permits, fees, film duplication, etc. called-out as line items). You then use the budget and schedule to help determine financing needs, and plan the actual production. The early budgets and schedules will be used as part of the financing process, so the producing staff knows how much to be asking for. As cast member salaries (and, sometimes, story demands) boost the budget, this must all get revised. Early design, scouting, previs, and camera tests will also influence the budget and schedule. As you refine what it is you're trying to do, you will almost certainly be forced to repeatedly decided between something you really want -- a cool shot, a great location, an expensive cast member, etc. -- and the realities of your budget. Sometimes, if you're early enough in the financing process and sufficiently skilled at getting people excited about your project, you might be able to boost the budget once -- but usually not. It's best to keep the very first iterations of all this stuff to yourself for as long as you can financially afford to do so with whatever seed money you bring to the project (and whatever free time your crew might give you). If you're lucky enough to be doing a big studio project, all of this happens on their dime, though how it then may get deducted against gross and therefore any back end you may be lucky enough to have negotiated (though probably not) is something for the lawyers to work out. And, indeed, there are a lot of things for lawyers to work out in terms of financing agreements, cast and crew contracts, rights agreements, and so on. It's crucial to have a professional, full-time entertainment lawyer with extensive film experience available to you throughout the process, especially if it's your first feature film. Script revisions come from notes received from big name cast members, the Director, the Producer, and if it's a studio film, the studio executives (either they read it alone, or from table reads and rehearsals -- though rehearsals often don't start until the moment after preproduction because on-screen talent often won't commit the time until on-set production is greenlit, so there's often at least one prepro iteration after prepro has officially ended). Script revisions can also come from other phases of the preproduction process, because the major reason for the preproduction process other than the budgeting and planning of the shoot is to do things that reveal problems in the film before you start incurring the high costs of being on-set. Storyboarding and Previsualization processes are in fact specifically designed to generate script revisions (and because of this, they are often omitted, particularly by Directors who -- right or wrong -- believe they don't need to incur the expense as they've already "got it all in my head"). Production design is the development of the visual look of the film. The Director and Cinematographer are generally the only ones participating in this other than the Production Designer (and sometimes, not even the Cinematographer, who may come in after design is basically finished). Production design establishes the basic look of the film, drawing, painting, and finding reference for major sets, costumes, buildings, vehicles, and even characters. All this feeds into the production art department, as well as location scouting, camera, and casting departments as the production design packets are the physical embodiments of the Director's visual goals. Storyboards (and animatics cut together from boards) are a way of working out structural, character, and visual storytelling elements before more expensive stages of production begin (camera tests, previs, and real production). Story iterates with the writer(s) on the script side, and production design and the camera department on the visual elements. Done properly, storyboards are like a first pass at both rehearsals and camera tests, without having to hire any actors or camera crew. Camera tests may then be done on specific shots that have been boarded (and/or previsualized) in order to find the best looking, most efficient and effective way to achieve them, whereas finding the shot during a test can incur higher costs due to space and equipment rentals (and finding a shot on-set can be project killing if you haven't done enough prepro work to make the changes happen within a solid framework of production, and know enough about your own goals to get the changes done quickly). Previsualization is a 3D computer graphics approach to exploring shot composition. Some people use this instead of storyboards, but generally boards have better "acting" in them (skilled board artists draw more relevant and convincing character emotions than you're going to get out of previs-grade 3D chracters). This makes them superior to previs for acting-driven sequences. 3D previs is particularly useful for shots with complex camera movements, staging, and choreography. In those cases a board artist may make shots look feasible that aren't (or, at least, aren't on your budget). A cost effective, simple 3D previs with a system that models real cameras and real grip gear such as FrameForge is a good way to test the viability of shots in a 3D space (a setup in a package like Maya can be even better, if you know what you're doing). Very complex, expensive films also use (high end) previs extensively just because there's so much going on it becomes an effective way to establish and communicate all the on-set needs for very complicated shots. Technical and craft scouting and tests are essential parts of preproduction that are fed by and feed back into both story development (if you an't get a crucial location on time and budget, then you need to change it) and production design. Camera tests in particular develop and refine the look, both in terms of the production design aspects of color and value in frame, as well as the compositional and pacing goals established in storyboarding and previs. The purpose of camera tests is to establish what camera, lenses, stock, and light kit will be the foundational basis of the shoot by proving that the combination can actually achieve the desired look by doing it. Going ahead with a shoot without doing any camera tests is foolish, and any Cinematographer who suggests this isn't worthy of the title. Every film has differences, and they need to be analyzed and understood before huge costs are being incurred on-set. Location scouting can be as essential as casting, especially in films where locations are basically characters (a chase across Mt. Rushmore is much different than a chase across "a big hill"). Location availability and cost also has a potentially big impact on budgeting and scheduling, and the physical aspects of the location impact production design and the work of the camera, electrical, and sound departments. Related tests and scouting may be done on some films where there are particular needs in terms of on-set sound (sound tests), music (bringing on a music director early to start establishing rights), or particular costumes, set pieces, vehicles, or other props that are key to the film and need to be established during preproduction in a manner other than merely being designed by the Production Designer. But generally most or all of this sort of thing happens during early production -- the part that secretly isn't actually on-set despite going on-set appearing in the most common definition of production -- because that's when you've actually received all the money and go-ahead needed to go on set (which is really when production starts). If you look at the diagram, you'll notice lots of arrows that show one phase feeding into another, and that phase then feeding back into the prior phase. That's because preproduction (and really all filmmaking) is an iterative process. The results of taking the results of one part of the process and refining it in another may cause something in that prior part of the process to change. Filmmaking isn't an "all at once" process. Think of iterating in preproduction a bit like doing takes on-set: with all the "moving parts" involved in making a movie you're terribly unlikely to get anything right the first time, so you need to actively plan to fail to do so. Iterating during preproduction is the least expensive opportunity to iterate and get more things right, and it is by doing so that you're able to effectively plan to fail to get things right on set and still manage to make the film you actually want to (or something close to it, anyway). Preproduction is the most overlooked, downplayed, and underappreciated part of filmmaking. That's because it is actually the most essential step in making a film, yet people generally want to skip most or all of it. Without sufficient preproduction, you're going into production and postproduction with no real idea of what you're doing. Even if you've made films before, at the beginning of every new project you should just assume you have no idea what's going to happen and why, and set about developing an good idea about that before you go on-set.